★★★★☆ Beautiful and Deeply Moving. 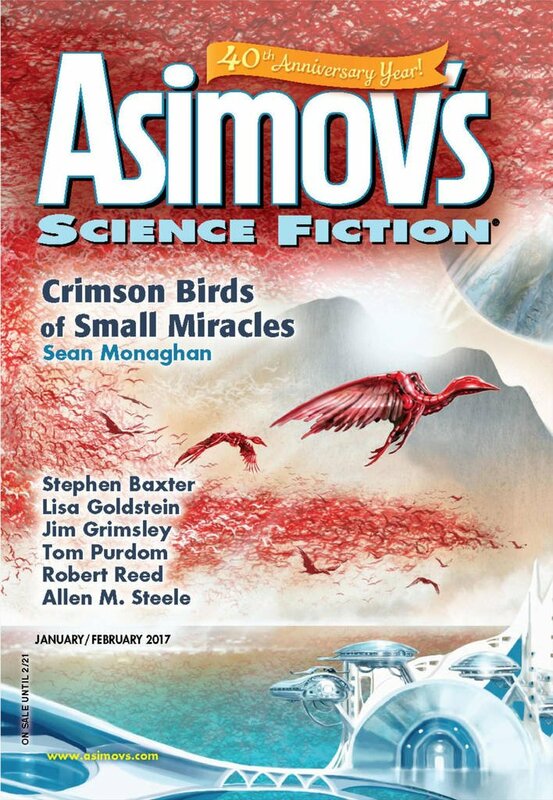 "Crimson Birds of Small Miracles," by Sean Monaghan [bio] (edited by Sheila Williams), appeared in Asimov's Science Fiction issue 01-02|17, published on December 15, 2016 by Penny Publications. Pro: The story does a good job of preparing us for Jesse's death. We know that they’ve run out of things to try and that Jesse is near the end of her expected lifespan. We know her language has deteriorated, and that her other symptoms have gotten worse. We also know that she’s gifted—starting with her symbolic picture choice. As symbolized by the Condor in the last scene, Jesse gets her freedom in the end. C.J. and Matilda are both solid characters, which makes us feel their loss powerfully. Through countless little things the story shows us that they loved Jesse. E.g. when Jesse goes back to the buffet after her accident and tries again, and C.J. wants to go help her, Matilda tell him to wait, and we realize she really does care for her little sister. Matilda has her own gift, and it’s fitting that she uses her art to create a memorial to her sister, but also as a way to get closer to her father. Con: It’s a tear-jerker. It’s not hard to make people cry over a little girl’s death. Even though we knew her time was limited, and even though she ended her little life on a high note, it was still crushingly sad. The narration is a little uneven in spots. And why does no one ever mention the girls’ mother? I'm a bit torn about this one. I find tear-jerking a bit one-note - it's certainly effective, but once it's gone, what's left? The actual story that remains is basically a very attractively portrayed alien vista. There's no denying that this was a well-constructed and effective story though, and the characterisation was excellent. Definitely not five stars, but well-above average. The best I can say about tear-jerking is that it doesn't work if the author hasn't made us care about the characters. Of course the most impressive are stories that make us cry tears of joy, not sorrow.